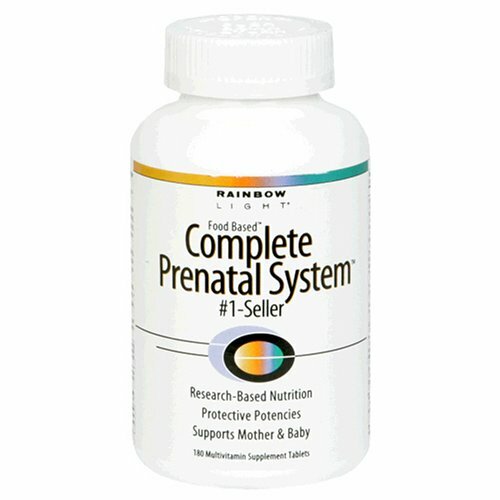 Our Complete PreNatal System multivitamin is the #1 selling prenatal formula in the health foods industry. Its the perfect multiple for pregnant and nursing women, providing essential nutrients childbearing women and growing babies require for excellent health. Designed to be especially gentle on the stomach, this formula also features fresh ginger juice extract. The very best pre-natal vitamin I've found! I first tried a different common supplement brand, as I was already making an order with them for my fish oil, and found them huge and hard to swallow. I also experienced constipation from the iron used in them, which was not fun. My midwife and a couple of others had recommended trying the Rainbow Light brand, and I also know them to have a really good reputation, so I decided to give them a try. After reading several reviews online and checking out the full list of ingredients, I decided the Complete Prenatal System was the right choice for me. I would rather take 6 smaller vitamins spread out throughout the day, than one huge one each morning. Also, these include enough probiotics and calcium that I don't need to supplement with anything extra (except Omega 3's of course!). Great vitamin! Causes no nausea and gives great energy. I've tried other pre-natals in the past and had various side-effects (tummy aches, weight gain, and an overall, blah feeling). These are food-based, and I have had no problems with any of the above symptoms. I was only nauseased my first trimester, but now that I'm in my 2nd, I feel great! They give me energy and I plan on taking them the remainder of my pregnancy. I bought this prenatal because I love that it is a whole-food vitamin. I don't even mind that you have to take 6 pills a day. What I do mind is that it exacerbates my pre-existing digestive issues. After researching a lot of different pre-natal pills I chose this and am so glad I did. Before I got pregnant I had been taking another brand that just made me feel to think about it - I don't what it was, the smell, the taste or what but it did not sit well in my stomach. I started taking the Rainbow Light system a month or so before I got pregnant, I am now 9 months pregnant and during the entire 40 weeks I have never had a problem with an upset stomach or keeping the pills down. What I love about this complex is that in addition to being a prenatal pill with all of the needed supplements it had the digestive support, superfoods and special prenatal blend to ease discomfort (ex. swelling, etc.) I have had an extraordinarily easy pregnancy and I certainly cannot say whether or not it was a result of taking this system but I am quite sure it helped. I never had morning sickness, swelling or any other discomfort other than the occasional heartburn that was eased quickly by Tums. Now, having raved about this product I must say that taking these pills are not a piece of cake. While the idea of taking 6 a day seemed like an easy proposition at first and made sense that it would help the nutrients absorb into my system better if space throughout the day it was often difficult to remember to take them. I spaced the 6 out by taking 2 with each meal and that worked most of the time but I would sometimes have to catch up and take 6 at the end of the day because I had forgotten. Lastly, I had trouble getting them down some days with just water because while they don't taste terrible, they really don't taste great. I found though that if I drank any sort of flavoured drink (like juice) then I was just fine. 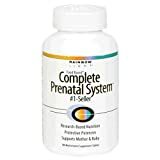 So, choosing this system certainly represents a commitment and most people thought I was crazy for taking 6 pills a day but I have to say that I have and still feel great and will be sure to take this brand with each successive preganancy. I took these throughout my pregnancy with my healthy son (now 2) and have already started taking them with my current pregnancy. With my first pregnancy, I tried just about every prenatal vitamin on the market. Everything made me sick. Even half a pill. Even with a full meal. Even at night. I tried everything and it still came right back up. So I quit taking vitamins! With my second pregnancy (twins), I knew couldn't possibly survive without a supplement. Sicker than ever (I swear everything was ten times worse), I stumbled upon the Rainbow Light Complete Food-Based Prenatal System and let me tell you it was a life saver! It NEVER ever makes me sick (I still take it since I'm nursing the twins now). If you have a problem with the idea of swallowing six pills a day, think of it this way: you are actually consuming nutrition your body will absorb and use. Regular commercial vitamin supplements are nearly entirely indigestible by your body (they pass through mostly whole) and on top of that are made up of chemicals your body can't use. If we are so used to taking medication and will take pain killers whenever we feel like it, why can't we take these healthy vitamins? My body reacted very well to this protect. My bathroom routine was the most normal ever. My skin was wonderful. My pms was calmer. I didn't feel sick from taking the pills. The pills are huge and they smell funny. It makes me want to puke but I hold my nose or I take it with orange juice. Something strong to mask the smell and taste. I have one bottle of these vitamins and I just can't bring myself to finish it after two months. First, you have to take SIX a day, three in the morning and three in the evening. They are large, uncoated vitamins with sharp edges going all the way around them. I choke on at least one a day, and sometimes I feel like I just can't get it down regardless of how much water I drink. I chose these vitamins because they had the nutrients I was looking for, but I had no idea of their size and shape. I was suffering through these vitamins when I asked my midwife if there was any way I could take a one-a-day vitamin instead of these ridiculous six-a-day horse pills. She said "Of course! Go to Longs/Safeway/Walgreens and pick up their prenatal vitamins." The chain store vitamins (which run around $20 a bottle for a 10 month supply) don't have all the extra minerals and supplements of the Rainbow Lights, but I just try to eat more nutrients in real food instead. It's so much better to take one coated vitamin a day instead of these horrible Rainbow Lights six times a day. This is my first time reviewing, and I chose to do it to put in another positive voice about this vitamin to help encourage anyone who is considering trying them to do so. I've tried a few brands of prenatal vitamin and the effects were not great. They made me feel uneasy or nauseated. One more expensive brand I picked up claimed it was easy on the stomach but was so volatile that even cutting the pill and taking an almost miniscule dose caused me to be physically sick.